Cupcakes for a Golfing Enthusiast! Tee off with these Cupcakes! 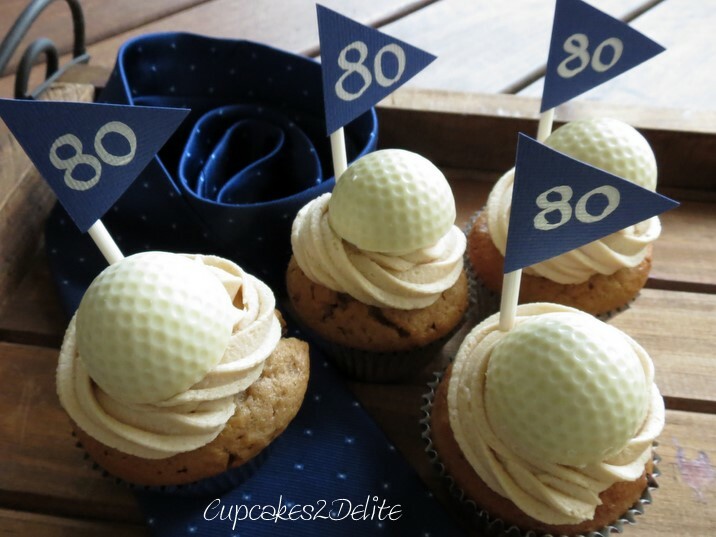 These golf ball cupcakes first appeared on my blog over a year ago when Simeon celebrated his birthday and when we celebrated Father’s Day, so it was fun to be asked to do them again for Jeanine who was celebrating her godfather’s 80th birthday a few weeks ago. Her colour scheme was silver and blue so I made delicious cappuccino cupcakes with creamy coffee icing in silver cupcake holders and then added half of a giant Geldhof golf ball chocolate to each cupcake. The blue flags complete the look and I photographed them here with an elegant blue tie. They could only but taste decadently delicious with the combination of cappuccino and rich Geldhof chocolate. ← Cupcakes for an Amazing Friend! Thanks, just changed the colour scheme to suit the function but those Geldhof golf balls are still totally yummy!